If you are staying on Paradise Island or Nassau in the Bahamas, you will be in close proximity to some fantastic coral reefs and undersea walls. Whether you are a new to scuba diving or an advanced diver, there are plenty of fantastic dive sites that offer amazing underwater attractions for all experience levels. 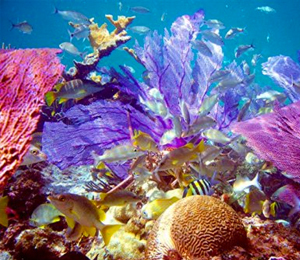 The colorful array of coral reefs provide habitat for a vast variety of exotic marine species. Below we have catalogued some of the best reef diving locales near Nassau and Paradise Island. If you have any inquiries about these reef sites or other Bahamian diving locations, our representatives will be pleased to speak to you via phone. This fabulous dive site is not only one of the most unique dive destinations in the Bahamas, but one of the most unusual natural dive locations on the globe. You will be amazed by the grand scale of this gigantic submerged crater. The Lost Blue Hole measures one hundred feet across the center of its borders. Although the hole descends to a depth of two hundred feet, most divers only dive to depths of eighty or ninety feet. The walled borders of this amazing dive site keeps the interior habitat very stable, creating a home for countless aquatic species, including the Reef Shark, Nurse Sharks, Marine Turtles, Yellowtails, Stingrays, Moray Eels, Sergeant Majors, and varieties of Angelfish, Groupers, Snappers, and Jacks. The water within the perimeter of the Blue Hole is calm and extremely clear. Large coral heads dot the perimeter of the Blue Hole. This shallow water reef, reaching depths of only thirty feet, is an excellent dive for divers of all experience levels. This thriving formation is actually three separate reefs that constitute a crude triangle. Barracuda Shoals, named for the toothy predators often seen hunting prey in the area, is reputed to be the best shallow reef near Nassau. A spectrum of corals and sponges provide an amazing variegated habitat for invertebrates and tropical fish, including Angelfish, Groupers, Grunts, and Snappers. This bustling reef is obviously nicknamed for its dizzying numbers of fish species darting amongst the thriving soft corals. You may witness French Grunts amongst the Sea Whips, Blue Striped Grunts beside delicate Sea Fans, and Yellow Goatfish near Gorgonians. This is another excellent for novice and expert divers alike. This circular, shallow reef ranges in depth from ten to thirty-five feet, which makes it a fairly easy dive for novices. Advanced divers will still appreciate the massive amount of fish at this site. This series of caverns of various sizes can be found in about forty-five feet of water along a large wall. The biggest of these cavern openings measures eight feet by four feet. The deepest of these caves are approximately thirty feet deep. Crustaceans, such as lobsters, can be seen in these caves. Large solitary groupers may also be hiding in these nooks. This relatively unchallenging dive site, as its name indicates, may not be a difficult, but it offers divers a multitude of aquatic species. This primordial spur reef has an astounding amount of delicate Sea Fans and other soft corals. You'll witness a colorful spectrum of exotic fish, including Snappers, Blue Tangs, Grunts, Squirrel Fish, Parrot Fish and Blue Wrasse. You may also spy a Nurse Shark alongside the reef. Barracudas hunt prey along the many limestone caverns and swim-through cover. This highly photogenic reef destination has served as the underwater setting for movies in the James Bond series. Visitors to this breathtaking reef may feel as if they are actually in a movie – the prismatic corals, including Stag-horn and Elk-horn provide a colorful backdrop for hundreds of marine species, including Snappers, Barracudas, Sergeant Majors, and Groupers. Because this site is so shallow dive (ranging from five to twenty-five feet) it draws snorkelers as well as scuba divers. This massive wall site can be found within the mammoth trench named the Tongue of the Ocean. Along this steep wall, divers will discover an astounding variety of sea creatures dwelling amongst both hard and soft corals. You can dive to depths of eighty or ninety feet to possibly view Reef Sharks, Sea Turtles, or Rays.